I was hoping I'd have a stunning snow photograph to post today, but Winter Storm Juno didn't reach southern Delaware as expected. For those that were hit, stay safe and warm! 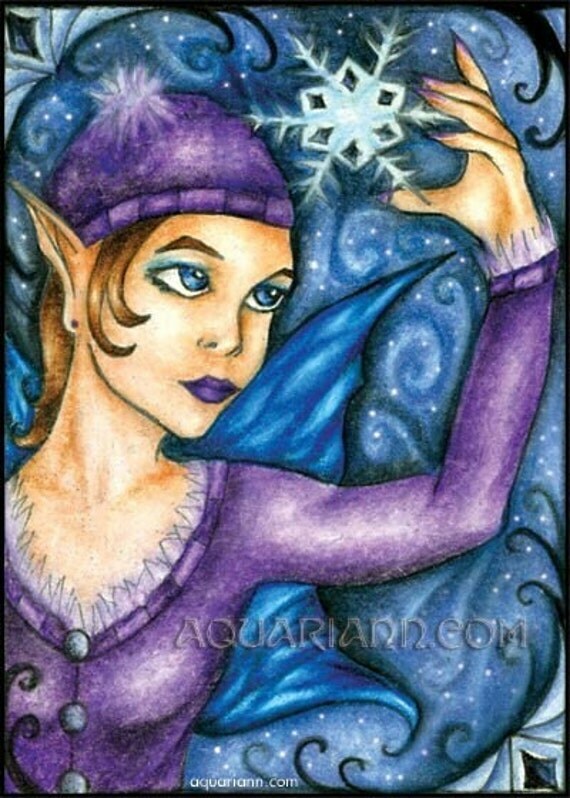 For those that weren't and are still wishing for white magic, I'm sharing my snowflake fairy drawing instead. I have one winter fairy art bookmark left in my Etsy shop, and will send a free matching magnet to the buyer that gives her a good home. That's beautiful! Have a terrific week! You drew this? You are quite the artist. Beautifully done! that's a beautiful drawing.. you're so talented! That is so beautiful, very nice. Wow that is beautiful! I'll have to pop over and see your etsy offerings! She is pretty! What did you use here? Thank you! I use ink and Prismacolor pencils to create all of my art. I love your Snowflake Fairy. I think she looks exactly like a Snow Flake Fairy would look. It's really awesome and thanks for sharing. She's so pretty! Love the colors. Today it's supposed to be almost 60!!! But snow this weekend. That's Iowa weather for ya! So beautiful! LOVE the purple and blue! Sorry you didn't get your snow, but your snow fairy is cute. Have a great Wednesday! You are funny! And talented too :) Lovely snow fairy! I very much prefer your fairy to the snow we got. Beautiful picture. I love this bookmark! I'd love to see your flower art on bookmarks too. Lovely! Seeing as you missed ( really, who misses snow) the storm I'd gladly send you truckloads! LOL. It does, however, provide some great photo ops! Have a good week.